THREE thoughtful teenagers have been so inspired by the phenomenal efforts of local people to the Mellon Educate project in Cape Town that they’re determined to go there themselves. 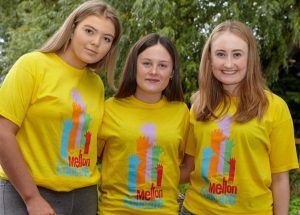 Ellen O’Neill (16) and 15-year-olds Rachel Keogh and Rachael Kirwan, all from the Castledermot area, have set a challenge of raising €16,000 so they can travel to Cape Town in November 2019 to help with the Mellon Educate project. Under the name Cape Town Team, the girls will take on a host of fundraising activities over the coming year as they set their sights on reaching their fundraising goal. “My mother Betty is a friend of Vera Smyth, who has gone to Africa nearly 20 times at this stage with Mellon Educate, and hearing from Vera about the work they do out there it just seemed like something really worthwhile,” says Ellen. “We’re all in transition year and we wanted to do something important with the year, so we decided to do this. Vera inspired the three of us,” adds Ellen. Ellen is a student at Gaelcholáiste Cheatharlach, while Rachel and Rachael attended Coláiste Lorcáin, Castledermot. “We’ve lots of things planned for 2019 ‒ bake sales at school, car washes and lots of other things. Our schools have been so supportive and have told us they’ll help in any way they can,” said Ellen. As the girls are under 18, they have to bring a parent with them to Cape Town, so €16,000 needs to be raised. The vast majority of this funding will be used during a seven-day building blitz in Cape Town in November 2019. “I can’t wait; it should be a brilliant experience. They are looking to build a whole school in just seven days, so there’s lots to be done,” adds Ellen. The girls held a car wash at Behan’s Garage, Castledermot on Saturday 17 November, which was really well supported and another car wash is planed for Horan’s, Castledermot on Saturday 1 December. They are hoping to attract lots of support over the year and would welcome all donations for this very worthwhile project.